Since my last post, I have learned some key facts about my books that make them even more interesting to me than before. Of course, I do not know everything about my books just yet, but the horizon is broadened. The Lord Byron book, although not the better of the two in terms of history, is a very cool book to see in person. The painting on the side I have learned is that of Lord Byron’s house. This is fascinating to me because I just so happen to be taking a class on English writers for which we are reading Byron’s works. Having his house on the side just adds to the mystery and reputation of Lord Byron. Being quoted as “mad, bad, and dangerous to know” the man has become much more interesting to me. His works themselves in the book are pretty good, but the painting is better. It demonstrates his ego and how living in what looks like a modern-day castle is just unreal. It says to me that he was as lavish and posh as he is depicted to be throughout history. When I began my research, I wasn’t as optimistic about the painting. I figured it was some church or a sanctuary from one of his stories, but having that actually be his house is rather unusual. 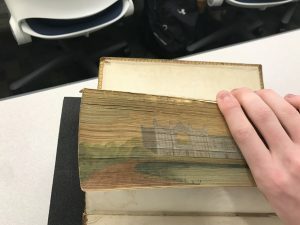 It creates a deeper connection between the painting, the book, and the author. The Book of Common Prayer was intriguing to learn more about, too. Overlooking the fact that it was bound by Edward of Halifax was a rather large mistake. I saw the connection but never really put two and two together. 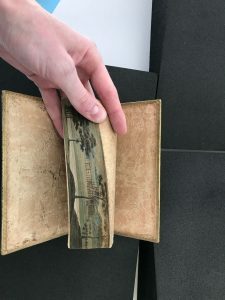 Of course, we have learned about Halifax and the impact he had on the development of fore-edge paintings, so it seems crucial to mention now, which makes that book much more important to the collection. 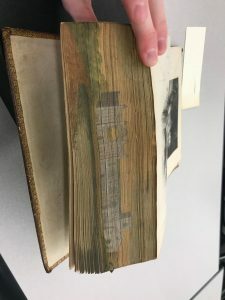 It may not be the best-looking book, but the history speaks for itself.